Hello everyone! Happy Memorial Day to everyone here in the USA. Hope you are enjoying a wonderful day with those you love and taking time to remember what Memorial Day is all about! 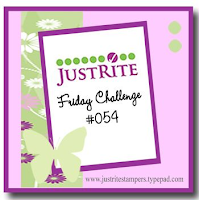 I have a card today for three different challenges: CR84FN, the Paper Players & Waltzingmouse. And can I just say that these three challenges are probably my most favorite challenges? I love the color combos that Mona comes up with week after week, the sketches at Waltzingmouse never fail to inspire and well... the Paper Players challenges are just darn fun! So combining the three was a no-brain especially since this week at the Paper Players the challenge is anything goes!! So.... here comes my card! 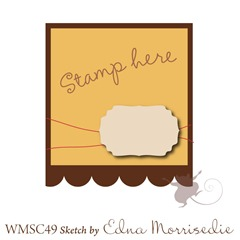 When I saw Edna's super sketch at WMS my thoughts immediately drifted to the WMS set Victorian Frippery and that lovely border stamp. And so once again I decided to stamp it and then trim out the scalloped portion to make my scalloped border. As I was doing this I had the brilliant thought that Claire needs to talk to Spellbinders or someone about creating a border die to match... wouldn't that be lovely?? Anyway... after much stamping, trimming and diecutting my card was finished. 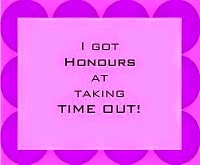 But to be honest while I think it is a nice card, it is rather plain... sigh! I almost took it apart this morning and remade it, but decided to just go with it anyway. One final thing... I got some exciting news yesterday. 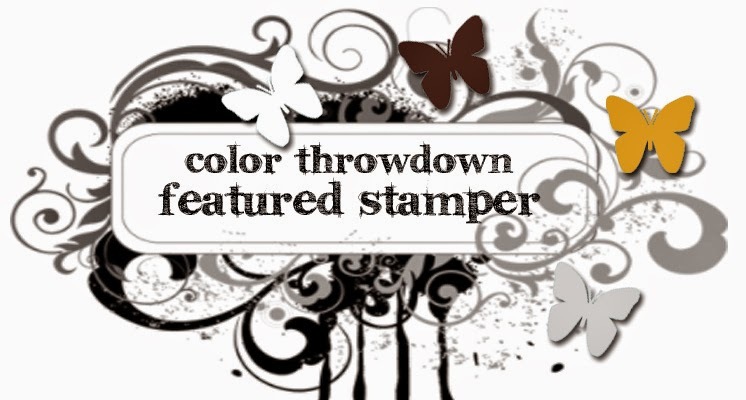 I'm the featured stamper this week over at Splitcoaststampers!! I can't tell you how fun it has been to go through the featured stamper gallery and take a look how others have intrepreted my cards!! Supplies: Cardstock: PTI kraft & Vintage Cream; Ink: PTI Vintage Cream, SU! Marina Mist & So Saffron; Stamps: WMS: Victorian Frippery, Very Vintage Labels 4 & Large Doily; Ribbon: SU! So Saffron; pin: Making Memories. Wow... can't believe I have done three hundred posts!! Seems like a lot to me and I have now been blogging for a year! That is kinda crazy, too! To celebrate I will be doing a giveaway in a few days, so... stay tuned!! Now... on to my card for the current Less is More. Those clever gals, Chrissie and Mandi, gave us this lovely sketch to work with, but we can only use ONE of the squares on the card! So once again I got the dog and took her for a walk so I could think in some peace and quiet about what I would do. I decided to go with placing my image squarely in the center of the card. 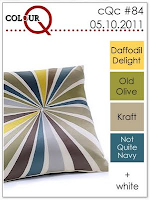 My color scheme comes from the current combo over at ColourQ of white, Delightful Daffodil, So Saffron, Real Red and Early Espresso. The stamp is from Hero Arts. The sentiment is from the Waltzingmouse set Frame It. 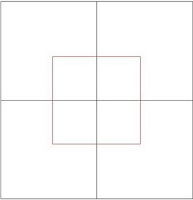 The card is a 4 1/2 x 4 1/2 square. 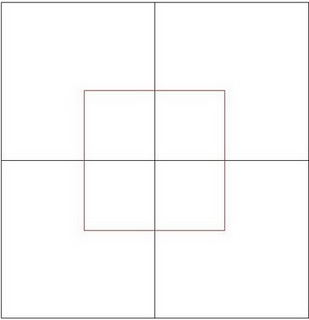 The center square is 2 3/4 x 2 3/4, the mat is 3 x 3. Hello everyone! I hope that Blogger hasn't been giving you too many problems this past week! 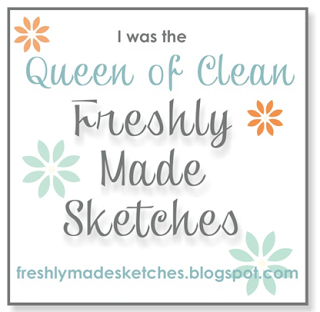 This week the challenge over at the ODBD blog is a sketch provided by the lovely and so very talented Sabrina! 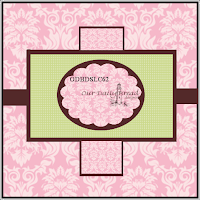 For my card I used the ODBD Scripture Collection 7 set. I just love this verse from Hebrews 11. I got out my Websters Pages Hollywood Vogue 6x6 papers and picked out a couple to work with. I also used one of my most favorite Spellbinders die set, Labels 4. I diecut three different sizes of the Labels 4 dies and layered them as you see. I finally broke down and purchased some of those darling Prima Fairytale roses I have seen lots of people using and now I'm hooked. They are just soo darn sweet and add so much to a card. The card is a 5x5 square card. To play along with the challenge you don't need ODBD stamps, but if you wish to be in the running for the Shining the Light award your project must use ODBD stamps. To make the challenge even more fun, a $15.00 gift certificate will be given to one randomly drawn winner! Happy Friday everyone!! I'm so excited because today I'm a guest designer for the Taylored Expressions Sketch challenge (TESC139)! For my card I used a new DCWV mat stack that I recently bought called Lemon Flower (thus the title). When I first saw this patterned paper at Joann's it was all but sold out and I was so disappointed because I fell in love with the instant I saw it! I just love the bright green and yellow combined with the grey... just yummy! But last week I was at my local Joann's and was delighted to see that they had more product so I snagged the mat stack. The stamps used are from the TE set "Friendship Blooms" and I used the coordinating TE die "Leafy Branch". 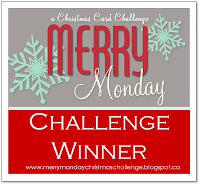 Quick post with a card two challenges. The current JUGs challenge to use "rainbow" colors and the current Waltzingmouse sketch. I did make a change to the sketch in that I went from a rectangular shape to the square shape. (Sorry I don't have the graphic for either challenge... next time.) I stamped the square frame from the WMS set "Frame It" using black ink on what cardstock and then adhered small buttons in the colors of blue, orange, yellow, red, purple and green on the card. The sentiment is also from Frame it. I really like how it turned out. It will make the perfect birthday card for a child, I think. 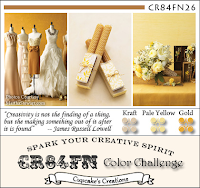 For the current CR84FN color challenge. 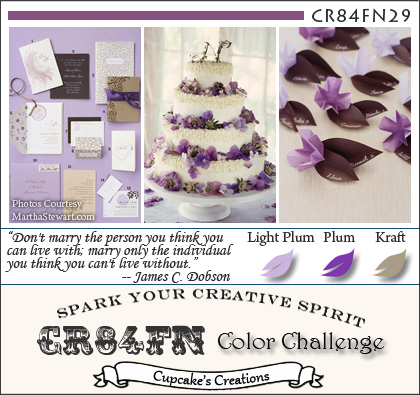 The colors this week are light plum, dark plum and kraft. I pretty much love anything with kraft... but for some reason this combo of kraft and plum (or purple) just really fascinates me. A few weeks ago the color combo over at Splitcoaststampers was plum, kraft & ivory. I made three cards using that combo! Anyway... my card today is really simple. I used the current CAS challenge from Splitcoaststampers for the layout. The only stamping on the card is the sentiment from the new Flourishes set Country Charm Labels. Patterned paper is from PTI and SEI. I used some PTI Plum Pudding grosgrain ribbon and another one of those felt roses I like so much. Hello! 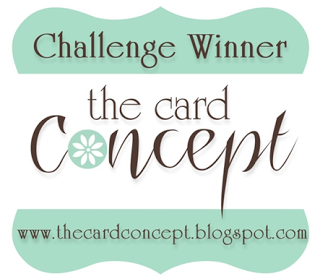 A quick post with a card for two challenge. 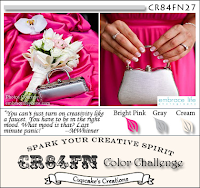 The current Flourishes Timeless Tuesday challenge (that closes in just a few hours, yikes!!) and the new Paper Players challenge. The Timeless Tuesday challenge is an inspiration challenge and they used a photo of a beautiful topiary that is made up of handmade flowers int bright spring colors. For my card I decided to pull out pink, yellow and green (sorry I don't have the inspiration photo!). I used the Flourishes set Gerbera Daisies and colored the image with the following Copic markers: RV21, RV04, R83, Y13, Y15, Y11, YG23 & YG03. 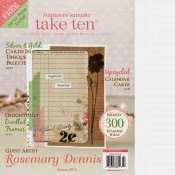 The image was diecut with Spellbinders large plain and scalloped circle dies. 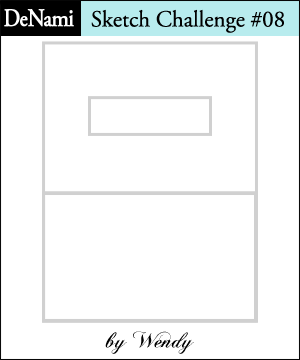 The layout of the card comes from the sketch provided in this week's Paper Players challenge. Hello!! The challenge today at Less is More is to make a CAS card using butterflies. Not a problem me other than trying to decide which butterfly image to use! After some thought I decided to use a Memory Box stamp I purchased along time ago and had never used.... sad, I know!! The image I used is one of their collage stamps called "Inspired Butterfly Collage". I inked it up with Memento's Tuxedo Black and then colored it with the following Copic markers: Y11, Y13, Y15 & Y19. Some Ranger Diamond Stickles were added to the body to finish off the piece. I mounted it on black cardstock for a bit more dramatic effect (I hope!). But, I couldn't stop there... so I made another one! This time using a fun butterfly image from a stamp set I won from Prickly Pear Stamps along with the matching die. Love winning stamping stuff, don't you?? Went really super clean and simple for this one. A piece of Melon Mambo cardstock was sitting on the counter and that was my inpsiration for my color choice. I diecut the butterfly and then stamped the image using Melon Mambo ink. Some random pink rhinestones were added. The sentiment was stamped in Melon Mambo, as well and I was done. Sigh.... I just love white space!! With all the added bling on the butterflies I'm going to pop this into the current CAS-ual Fridays challenge, as well. Hello, everyone! It's Saturday and time for the new challenge over at the ODBD blog... ODBDSLC61. This time the team is challenging you to use gingham and/or plaid on your card. For my card I chose to use some yummy black and white gingham ribbon that I have from May Arts. I paired it with an image and sentiment from the ODBD set, Friendship. Using the 2nd largest die from the Spellbinders Labels Nine dies I diecut white cardstock and black cardstock. The swirly butterfly image was stamped on the white diecut piece using grey ink and then the sentiment was overstamped using black ink. A bit of distress ink was used on the edges. The white diecut was then layered with the black diecut as shown. Some clear rhinestones were added at the bottom. I used some SU! designer paper called Night and Day for the top half of the card. The diecuts were then adhered to the card base. I tied the bow, adhered it and I was done. You don't need ODBD stamps to participate in the challenge. However, if you want to be considered for the Shining the Light award you creation must use ODBD stamps. To make things even more fun a random chosen person will win a $15.00 ODBD gift certificate! An interesting color combo today from ColourQ. I almost passed it up, but I just have to give it a try and see what I could come up with for a card. 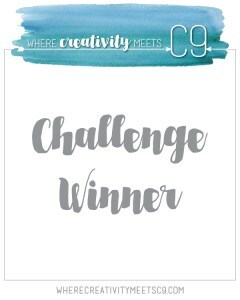 To help me along I combined ColourQ with the current Stampin Sisters in Christ challenge to make a project using a teapot or teacup. So... I reached for my Taylored Expressions Creativi-TEA set and two different Waltzingmouse sets: Victorian Frippery & Large Doily. The other day I made a card where I used the border stamp from Victorian Frippery to create a layered border. This time I stamped the border along one side of the card base using SU! 's Chocolate Chip ink. I stamped the border again on a 1 1/2 strip of white cardstock and then trimmed it out as shown. I really quite like the look of the trimmed out border image. The teapot was stamped using SU! 's Groovy Guava, a peachy color similar to Peach Parfait. One of the doily images was stamped using grey in and then diecut. A scalloped circle was diecut from Sahara Sand cardstock as a mat. The ribbon is PTI's Melon Berry double stitched. The whole thing was finished with a rolled rose made from white felt. Hello!! Have a card for the current Waltzingmouse sketch challenge today. 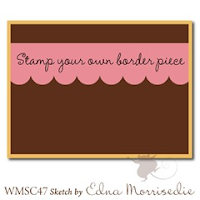 One of the elements of the sketch was to create your own stamped border piece. When I saw that I immediately thought of my WMS Victorian Frippery set and the beautiful lace-like border in the set. I decided to use the current color combo from Splitcoaststampers of Rich Razzleberry, Vanilla and Regal Rose for the card, as well. The border was stamped on two pieces of card stock using Rich Razzleberry for one piece and a combo of PTI's Berry Sorbet & Palette Boudoir Blush and then each piece was trimmed as you see. I layered the two pieces using foam dimensionals. The sentiment is from the WMS set Fancy Phrases. I'm also going to put this into the current Really Reasonable Ribbon challenge "anything goes". a couple of cards I made last week for two different Flourishes release week challenges. When Blogger started acting up I was very thankful that I still had Splitcoaststampers where I could post both these cards because otherwise I wouldn't have won the entire Flourishes May release!! Cannot tell you how excited I am to have won! My first card was for their 3 in a Row challenge. For may card I used the Flourishes set Sunflowers. I absolutely LOVE how this card turned out. The green bling I used on my die cut is from want2scrap... some of their super cool Nestabling! The sunflower was colored with a bunch of Copics, unfortunately I don't remember which ones. I must say another big THANK YOU to all you amazing LIMettes and Lady LIM Chrissie and Diva LIM Mandi for all the lovely, lovely comments!! They just make my day ladies!! Now... on to my card for Less is More. 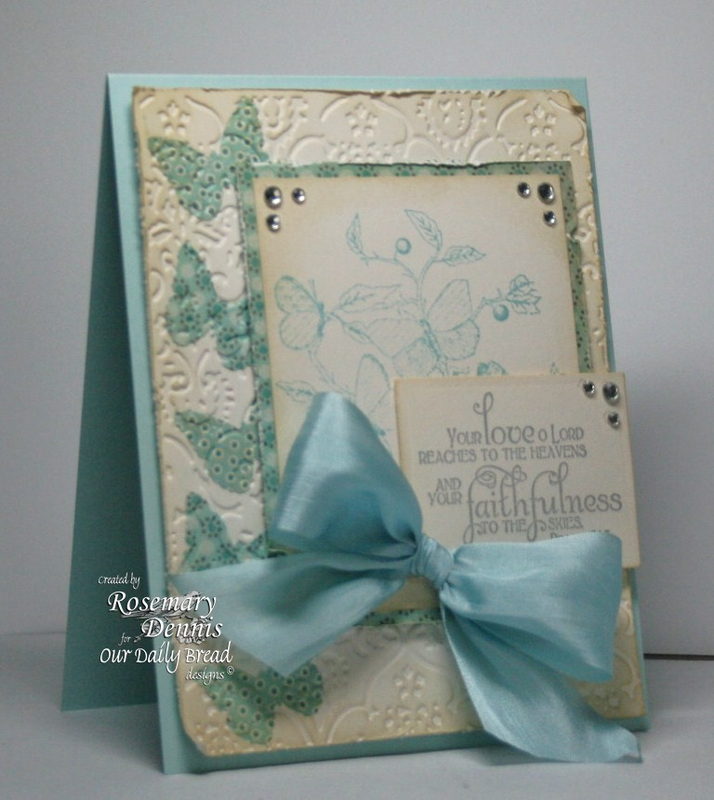 This week is one layer challenge week and Chrissie and Mandi have asked us to do some embossing, either heat/wet or dry. I decided to do both. One of my favorite ways to emboss is to use VersaMark watermark ink and stamp it on to colored cardstock, apply clear embossing powder and heat set. The color of the cardstock just "pops" with this technique. I decided to use kraft cardstock because next to white cardstock kraft is my favorite. Using the largest rectangle in the Spellbinders Large Rectangle dies I embossed the rectangle onto my card base. I then stamped the damask image from the SU! set Bliss in the center, applied the clear embossing powder and heat set. I finished off the card with a simple "thank you" stamped in black ink. Simple as simple can get, but well... I like simple!! Hello, everybody!! Hopefully everything is back to normal with Blogger and we won't be having any more troubles!! The challenge this week for the ODBD Shining the Light (ODBDSLC60) challenge is a "recipe" challenge: 2 diecuts, embossed background and one sentiment. For my card I used several ODBD sets and dies that are exclusive to ODBD: Elegant Ovals dies and the Single Butterfly die. For my embossed background I used a Sizzix embossing folder that I do not know what it is called... it came in a set called Hello, Friend. I used mainly purple and white for the card with a bit of kraft thrown in to break things up. 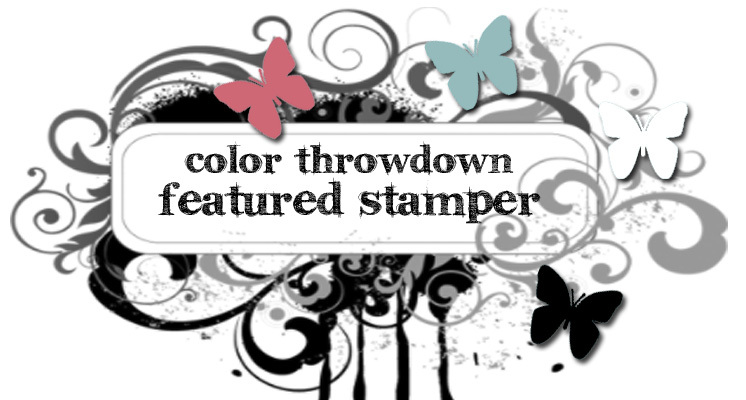 I stamped the ODBD Single Butterfly stamp on white cardstock and colored with Copic markers (apologies... I didn't keep track of the colors that I used!) and then diecut it using the ODBD Single Butterfly die. The kraft and white cardstocks were diecut using the exclusive ODBD/Spellbinders dies called Elegant Ovals. 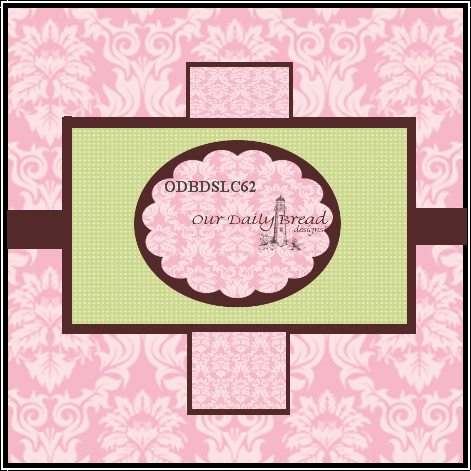 To play along with the challenge you don't need ODBD stamps, but if you want to win a Shining the Light award your card must feature ODBD stamps. To make the challenge even more fun one random winner will get a $15 gift certicate to the ODBD store!! If you are uploading to Splitcoaststampers, please use the keyword: ODBDSLC60. Thanks for taking a peek... I hope you will play along! This card would have been entered into two different challenges! But because Blogger went down for over 24 hours, I wasn't able to enter it into this week's Waltzingmouse sketch challenge... sigh! 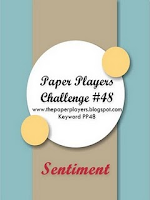 So, I'm just entering it into the other challenge... the Paper Players! This week the challenge over at The Paper Players is a color challenge to use Cherry Cobbler, Not Quite Navy & Early Espresso. It took a bit of time for me to figure out a nice way to combine the colors, but I really like how the card turned out. It is a little on the masculine side... but that's okay. Some day I may need a thank you card for a guy!! All stamps used are from the Waltzingmouse set Victorian Frippery. *Edited: The original post showed up right after I did this repost... double sigh! * Sigh... This whole thing with Blogger being down was really annoying. I lost the last post I did, so I'm re-posting the cards today. Don't think I will go into the long explanation that I did with both cards other than to say that the first card is for the curernt ColourQ challenge and the second card is a just sharing card that I made for the current Penny Black challenge to make a long card. Both cards were made using Penny Black stamps. The first card is actually a long card instead of a tall card because I decided to change the orientation of the card. The second card is a tall card. I made it using one of my very favorite Penny Black stamps called Christmas Star. Hello... finally got a chance to make a card today that was just for fun and for a few challenges. I have been busy making things the last few days, but nothing that I can share... at least not yet. Because I was struggling so much I just kept things as simple as I could. I flipped the sketch on it's side because it just worked better for me. A rolled rose was made with some grey felt and the medium rolled rose die from My Favorite Things. Those dies are the neatest things. I just saw that they have a new one that makes rolled daisies which looks pretty cool. To add some interest to the grey paper I ran it through the Big Shot in the Swiss Dot embossing folder. And, of course, I had to put some ribbon on the card. I fiddled (as usual) with the bow for the longest time to get it just right because if the bow ain't right then momma ain't happy... I'm also going to put this card into the current Flourishes challenge of anything goes. A card for the current DeNami Design sketch challenge, as well as for the current Really Reasonable Ribbon challenge, Double Dutch. 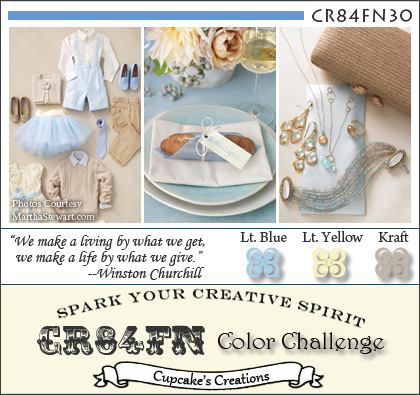 I also used the current color combo from Color Throwdown of pink, kraft, light blue, and dark brown. I stamped the little tulip image from DeNami randomly on the white cardstock using SU! 's Pretty in Pink and then colored each of the little flowers with Koh-i-nor pencils and some gamsol. I applied a strip of Scor-Tape to the bottom of the piece and adhered the lace trim by pleating it a bit to create the ruffled look. Some Baja Breeze seam binding from Stampin Up! was tied around the piece and then I attached the whole thing to the kraft card base. 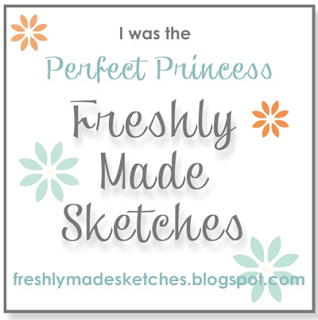 I stamped the sentiment from one of PTI's Fillable Frames set on white cardstock using SU! 's Early Espresso, punched it out using a SU! punch, applied the pink rhinestones and attached with foam dimensionals. First I must say a very big THANK YOU to all the lovely LIMettes (and you know who you are!) who have left me the most wonderful comments over these last few months! Ladies... you all ROCK!!! Now.. on to my card for this week's challenge. This week at LIM it is a color challenge and clever Chrissie and Mandi have challenged us to use white on white. Oh.. the thought of all that white space just makes me swoon! As I left some comments for those LIMettes who have already gotten their cards done I pondered what I would do for my card. I decided almost immediately to do some embossing, but then had to decide on which folder. My first thought was the SU! 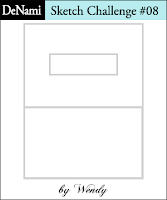 Elegant Lines folder... so perfect for white on white embossing. But then I remembered my neglected Manhattan Flower folder and decided to use it. I also used the SU!/Sizzix Embosslits Beautiful Wing. The sentiment in from the SU! set Vintage Labels. Some tiny Hero Arts gems finished off the card. Hi everyone! 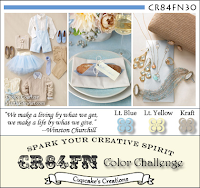 Today is my first post as a guest designer for the ODBD Shining the Light challenge and I am so excited. The challenge this week is to use the super fun technique of embedded embossing. It is a pretty straight forward idea. You take a piece of cardstock cut to fit the front of your card. You glue punched or diecut pieces of patterned paper or cardstock to the first cardstock piece, let the glue dry for a bit, place the entire piece in your embossing folder and run through your embossing machine. It is suggested that you use a embossing folder that has a pretty detailed pattern so that the glued on pieces don't start popping off. For my card I used the Sizzix embossing folder, Textile. I used a Martha Stewart butterfly punch for the butterflies. They were punched from two different pieces of patterned paper from the My Minds Eye Stella & Rose (Hazel) 6x6 pad and then adhered along one side of the card. The ODBD set Faith was used for the main image and verse. The card was finished with a light blue silk bow and some clear rhinestones. Thanks for taking a peek.... 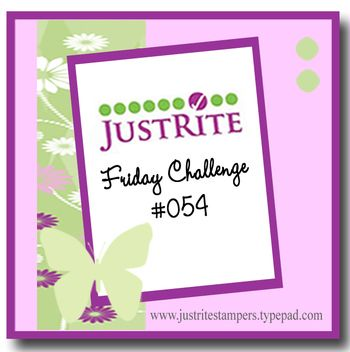 I hope you will play along this week and give embedded embossing a try! A couple of cards for One Layer Wednesday. Susan set the challenge for us to make a card using circles. Now when I first saw the challenge I immediately thought of my PTI set Dot Spot. A super fun set full of circles within circles. Then I thought of the really neat Hero Arts stamp I have called Large Artsy Circle. But then I thought to myself "geez... get outside your box, Rosemary, and think of something else"! So then my thoughts drifted to a sweet Memory Box stamp called Bramble Wreath and to the cute Hero Arts stamp Bicycle. So I made two cards. The first card uses the Bramble Wreath stamp and a stamp of my favorite saying. 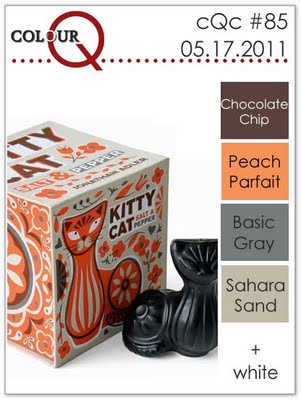 I used this week's color combo from Splitcoaststampers of Cherry Cobbler, Crumb Cake & Black. For the second card I stamped the bicycle image using the Hero Hues ink, Grass. A yummy, juicy and oh so springy color. I colored the basket and teeny tiny flowers with Koh-i-Nor pencils. The sentiment is from the PTI set Everyday Button Bits. The other day I posted a card that was an unlikely combination of CAS and shabby. My card today is definitely more on the shabby side of things. 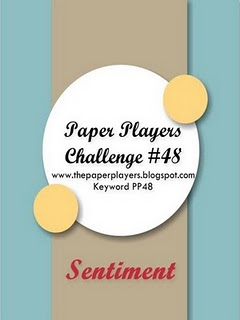 I made this card for two challenges: CR84FN and The Paper Players. 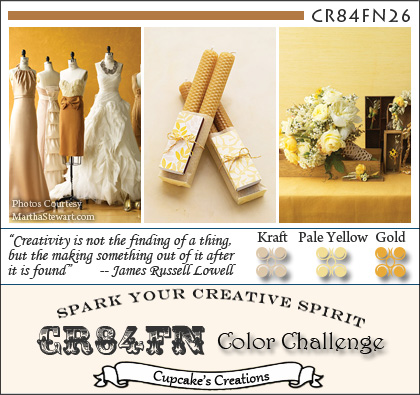 The color combo this week from CR84FN is kraft, light yellow and gold. When I started my card I thought I would do some gold embossing, but to be honest I don't really like gold embossing on too many things except maybe Christmas cards! I did try embossing the hydrangea in gold, but didn't like the look. So, in the end I brought in the gold by using some gold glitter brads and gold Stickles. Now where does the Paper Players challenge fit in all this... why the flower and the bees! The challenge set this week by sweet LeAnne was to use flowers, trees, birds and/or bees on our cards since spring has finally (we hope!) arrived. Some Stampin Up! designer papers called Botanical Gazette fit the bees portion perfectly and the other great thing is they worked for CR84FN, as well. All the stamps are from Stampin Up! I'm going to give this card to my mother-in-law for Mother's Day. Thanks for taking a peek... as I write this post I hear the birds and can see the flowers and trees... now we just need those bees! I know it sounds like CAS can't be shabby because CAS stands for "clean and simple", but I think in certain instances CAS can be shabby. Take for instance my card for the current Shabby Tea Room challenge. Don't you just love that inspiration photo?? The basic idea of the card is CAS with limited use of embellishments and lots of "white" or in this case, "kraft" space, but I was able to shabby it up by distressing the patterned paper, using stamps that lend themselves to the shabby chic look and adding some lace. The stamps are from a favorite Stampin Up! set called "Bliss". I just love the damask image and the little flower that comes with the set.